Cornelia Connelly School is pleased to announce the opening of the new IDEAS Center on Wednesday, January 13, 2016. 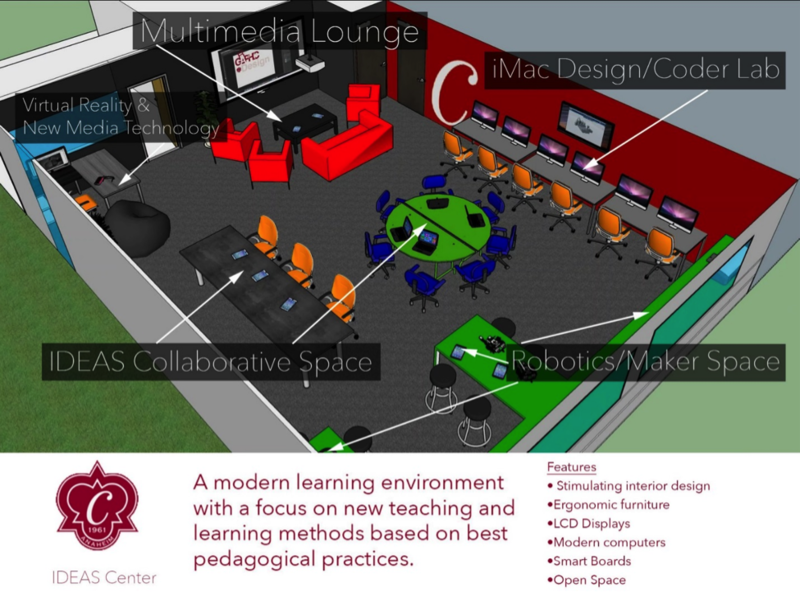 The IDEAS Center, an acronym for Innovation, Design, Energy, Artistry, Synergy, was designed to be an innovative space for active learning where students develop new skills through the creative use of technology. Every space was designed with the thought of peer-to-peer learning and collaboration. The aesthetics and furniture combine to create a learning atmosphere that is engaging for both student and teacher. The Most Reverend Kevin Vann, JCD, DD presided over a special Mass held in Connelly’s Gunther Auditorium, which was filled with students, faculty, staff, parents, Board members, donors, and alumnae. Other guests present included Fr. Jerry Horan, O.S.M., Vicar for Faith Formation for the Diocese of Orange; Gregory Dhuyvetter, Superintendent of Catholic Schools; Shirl Giacomi, Chancellor of the Diocese of Orange; Teresa “Tita” Smith, Executive Director of Catholic Charities of Orange County and Mayor of Orange; and Steve Perales of Shea Family Charities. Bishop Vann expressed his delight at being on the Connelly campus for the occasion. After Mass, Bishop Vann and the congregation processed across the campus to the new IDEAS Center, where Connelly’s ASB officers held a red ribbon to cut. Priscila Forbes, Chair of Connelly’s Board of Trustees, talked about the IDEAS Center and then invited Bishop Vann to join her and Sister Francine to cut the ribbon and officially open the new Center. After the ribbon cutting, Bishop Vann prayed a blessing for the IDEAS Center, and then went inside to bless the room. The students, Board members, parents, alumnae, and special guests were then welcomed to enter the IDEAS Center to try out all of the new technology at their fingertips. The excitement in the air was palpable as everyone, especially the students, eagerly went from one technology station to the next while the two 65” and one 70” video display panels above cycled through various messages welcoming everyone to the IDEAS Center.